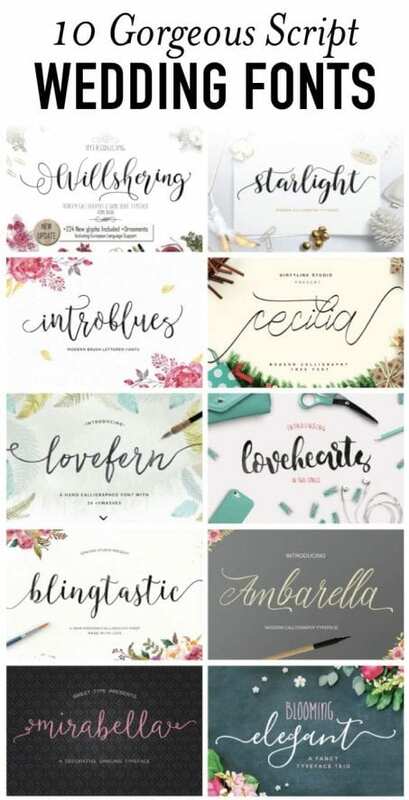 Check out these 10 Beautiful Script Wedding Fonts from Creative Market to make your wedding or event invitations looking elegant! Guys! Have you discovered Creative Market? It’s seriously my favorite!! When my husband was in graphic design school we both learned to become total font snobs. I remember the day I realized I designed our church bulletin years prior with Papyrus and Comic Sans throughout the bulletin. Shoot me now!! What was I thinking?! Thankfully, I have learned better though and as my picky husband would critique my self-designed work I learned what makes a great font and what doesn’t. Dafont has always been my go-to when it comes to finding new fonts until about 6 months ago. I discovered Creative Market and have never looked back! You can purchase stunning fonts, including glyphs and swashes, for a very low price. With wedding season coming up, I thought it’d be fun to round up 10 gorgeous wedding fonts. If you’re DIY-ing your wedding invitations or are just looking for some elegant script fonts, these are some great options! Do you love these script wedding fonts? Which is your fave? I know I raved about it in my blogging resources post, but in case you missed it, make sure you’re signed up for Creative Market’s newsletter. Every Monday you’ll get access to a free font and graphics. I’ve found some of my absolute favorite fonts this way! And free is an awesome price!! If you love these fonts as much as I do, I’d love for you to pin it to Pinterest or share on Facebook! Subscribe to save money, time, & resources! Subscribe and get this free PDF with 9 handy DIY hacks & tips you need to know! Success! Now check your email to get your free PDF.